(with a Data Bank) – A Critical Review. 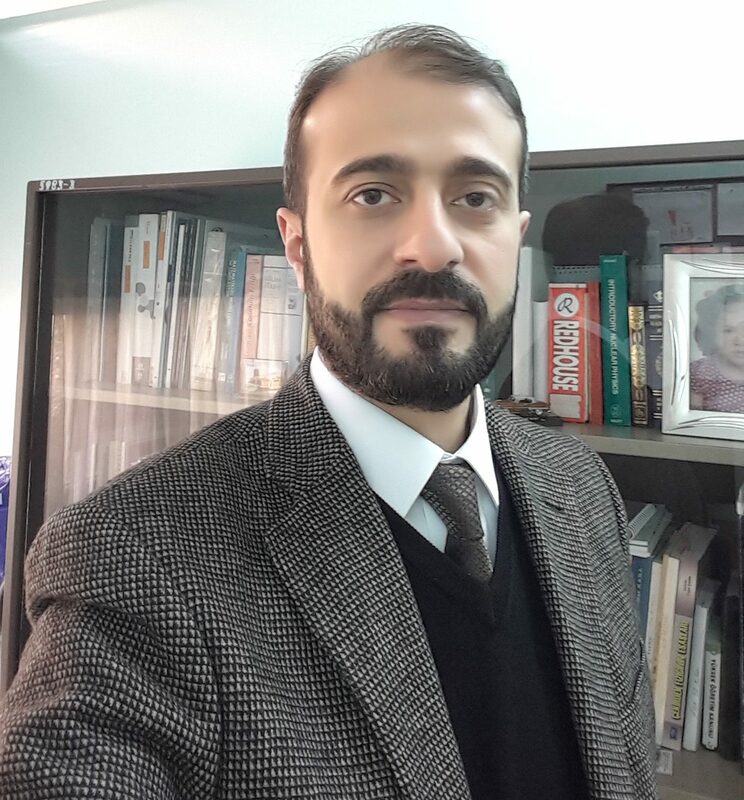 Kamişlioğlu, M., Bilici, S., Külahci, F., 2018, Determination of relationships between Radon Gas (222Rn), earthquake and meteorological parameters with Kriging and Regression methods. Külahcı, F., Niksarlıoğlu, S., Şen, Z., 2018, A Geostatistical Method for Spatial Prediction of Radioactive Fallout: Cumulative Ordinary Kriging and its Chernobyl and Fukushima Applications. Bilici, S., Külahcı, F., 2018, Spatial Modeling of Cs(137) and Sr(90) Fallout in the Hazar Lake after the Fukushima Nuclear Power Plant Accident. Aközcan, S., Külahcı, F., Mercan, Y., 2018, A Suggestion to Radiological Hazards Characterization of 226Ra, 232Th, 40K and 137Cs: Spatial Distribution Modelling ,Journal Hazardous Materials, Impact Factor: 6.065 in 2018. Spatial distribution modelling provides very significant information for the migration of radionuclides in environmental systems. 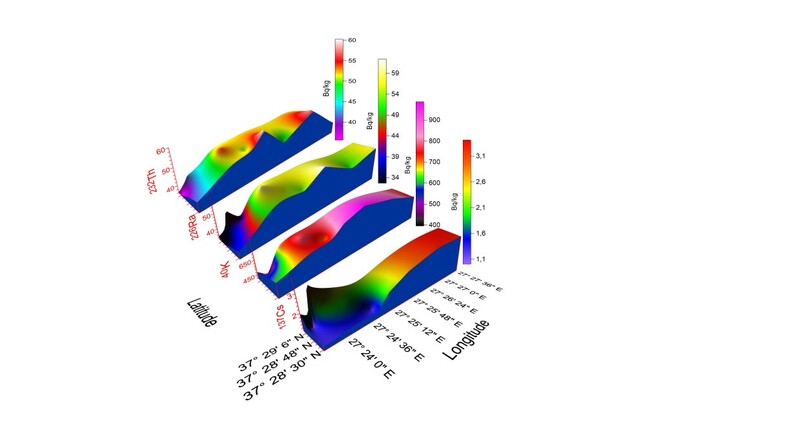 The figure shows the 3D transport characterization of some radionuclides in the Bafa Lake, Turkiye. Aközcan, S., Külahcı, F., 2018, Descriptive Statistics and Risk Assessment for the Control of Seasonal Pollutant Effects of 210Po and 210Pb in coastal waters (Çanakkale, Turkey), J Radioanalytical and Nuclear Chemistry, 315, 2, 285–292. Akarsu, S.A., Yilmaz, M., Niksarlioglu, S., Kulahci, F., Risvanli, A., 2017, Radioactivity, Heavy Metal and Oxidative Stress Measurements In The Follicular Fluids Of Cattle Bred Near A Coal-Fired Power Plant, The Journal of Animal & Plant Sciences, 27(2), 373-378. 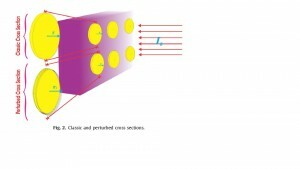 Külahcı, F., 2016, Spatiotemporal (Four-Dimensional) Modelling and Simulation of Uranium (238), 75, 452, E Earth Sciences. 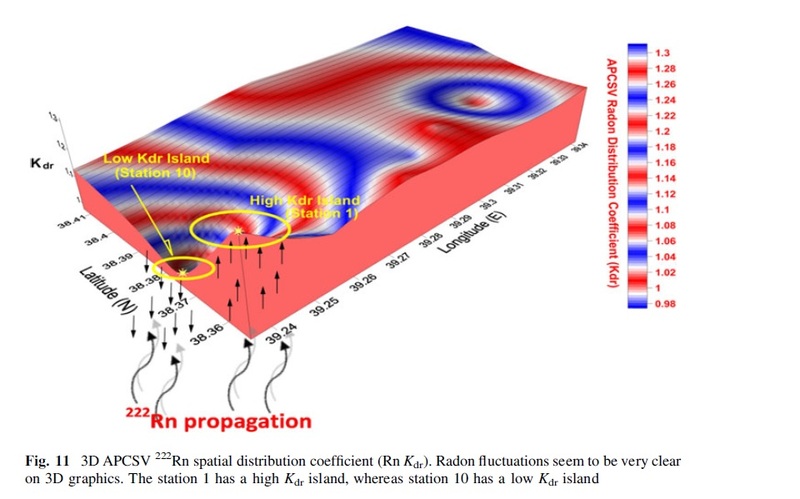 Kamislioglu, M., Külahcı, F., 2016, Chaotic Behavior of Soil Radon Gas and Applications, Acta Geophysica, 64, 5, 1563-1592. Külahcı, F., 2016, Proposals for Risk Assessment of Major Cations in Surface Water and Deep Sediment: Iso-Cation Curves, Probabilities of Occurrence and Non-Occurrence of Cations, 75, 980, E Earth Sciences. 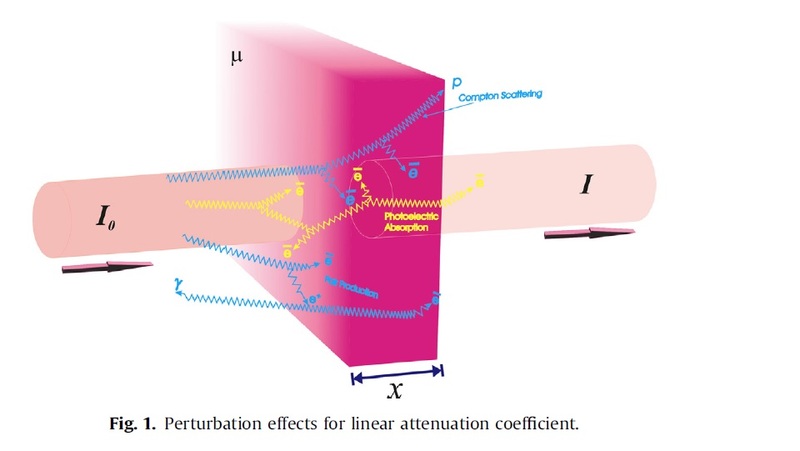 Külahcı, F., Şen, Z., 2014, On the Correction of Spatial and Statistical Uncertainties in Systematic Measurements of 222Rn for Earthquake Prediction, Surveys in Geophysics, Impact Factor: 5.112 in 2014, 35 : 449–478. Külahcı, F., Şen, Z., 2009, Potential Utilization of the Absolute Point Cumulative Semivariogram Technique for the Evaluation of Distribution Coefficient, Journal of Hazardous Materials, 168, 1387-1396. Impact Factor: 4.529, Ranked 1 in 2009. Kulahci, F., 2011, A Risk Analysis Model for Radioactive Wastes, J. Hazardous Materials, 191, 349–355. Impact Factor: 4.529. Külahcı, F., Şen, Z. 2009, Radioactive Contamination Research Developments: Progresses in Radioactive Contamination Researches, Nova Science Publishers, Inc., Editor: Nadine K. Henshaw and Cade S. Alleyne, ISBN: 978-1-60741-174-1, Page: 1-42. (Invited “Book Chapter”). 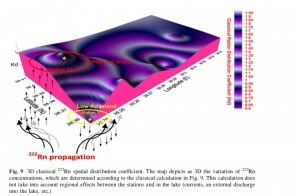 Külahcı, F., Şen, Z., 2009, Spatio-Temporal Modeling of 210Pb Transportation in Lake Environments, Journal of Hazardous Materials, 165, 525-532. Impact Factor: 4.529, Ranked 1 in 2009. Niksarlioglu, S., Kulahci, F., 2013, An Artificial Neural Network Model for Earthquake Prediction and Relations between Environmental Parameters and Earthquakes, WAS Engineering and Technology, 74, 984-987. 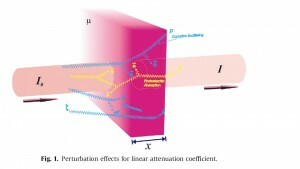 Kamislioglu, M., Külahcı, F., 2014, Investigation of nonlinear behavior of Radon (Rn-222) gas, IEEE Signal Processing and Communications Applications, IEEE, art. no. 6830202, 208-211. Niksarlıoğlu, S., Külahcı, F., Şen, Z., 2015, Spatiotemporal Modeling and Simulation of Chernobyl Radioactive Fallout in Northern Turkey, J Radioanalytical and Nuclear Chemistry. Külahcı, F., Çiçek, Ş., 2015, Time-series analysis of water and soil radon anomalies to identify micro-macro earthquakes, A J Geosciences. Külahcı, F., 2014, Characterization and Transportation Behaviour of Uranium-238 Particles in Water: A Four-Dimensional Analysis (submitted). Kamışlıoğlu, M., Külahcı, F., Şen, Z., 2014, Nonlinear Reply of Soil Radon (222) Gas Measurements and Deterministic Chaos (Under Review). Aközcan, S., Yılmaz, M., Külahcı, F., 2014, Dose Rates and Seasonal Variations of 238U, 232Th, 226Ra 40K and 137Cs Radionuclides in Soils along Thrace, Turkey, J. Radioanal. Nuclear Chemistry, 299, 95–101. Kamislioglu, M., Külahcı, F., 2012, An Adaptive Fuzzy-Neuro Model on Earthquake Prediction. Külahcı, F., Şen, Z., 2009, Risk Assessment of Distribution Coefficient From 137Cs Measurements, E Monitoring and Assessment, 149, 363-370. 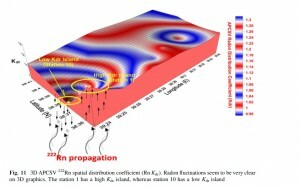 Külahcı, F., et al., 2009, Artificial Neural Network Modeling for Earthquake Prediction with Radon Monitoring, A Radiation and Isotopes, 67, 212-219. Şahin, S., Külahcı, F., Dogru, M., 2011, Determination of (90)Sr, (129)I and gross beta radioactivity concentration in some teas, J. Radioanalytical and Nuclear Chem., 290, 2, 313-318. Külahcı, F., Şen, Z., Kazanç, S., 2008, Cesium Concentration Spatial Distribution Modeling by PCSV, WAS Pollution, 195, 151-160. Baykara, O., Inceoz, M., Dogru, M., Aksoy, E., Kulahci, F., 2009, Soil radon monitoring and anomalies in East Anatolian Fault System (Turkey)”, Journal of Radioanalytical and Nuclear Chemistry, Vol. 279, 1, 159–164. Külahcı, F., Şen, Z., 2008, Perturbation Distribution Coefficient Definition, FEB., Vol.17, No.3., 326-330. Baykara, O., Inceoz, M., Kulahci, F., Dogru, M., Aksoy, E., 2009, Assessment of 222Rn concentration and terrestrial gamma radiation dose rates in the seismically active area, J Radioanalytical and Nuclear Chemistry, 278, 59-63. Külahcı, F., Şen, Z., 2008, Multivariate Statistical Analyses of Artificial Radionuclides and Heavy Metals Contaminations in Deep Mud of Keban Dam Lake, Turkey, A Radiat. Isotopes, 66, 236-246. Külahcı, F., Şen, Z., 2007, Spatial Dispersion Modelling of 90Sr by Point Cumulative Semivariogram in Keban Dam Lake, Turkey, Applied Radiat. Isotopes, 65, 1070-1077. Baykara, O., Külahcı, F., Doğru, M., 2007, The Measurement Of Uranium Concentration In Soil Samples By Two Different Methods, J. Rad. Nuclear Chem., 272, 1. Kulahci, F., Dogru, M., 2006, The Physical and Chemical Researches in Water and Sediment of Keban Dam Lake, Turkiye: Part 1- Radioactivity Iso-Curves, J. Nuclear Chem.,268, 3, 517-528. Kulahci, F., Doğru, M., 2006, The Physical and Chemical Researches in Water and Sediment of Keban Dam Lake, Turkiye: Part 2- Distribution of Radioactivity, Heavy Metals and Major Elements, J. Nuclear Chemistry, 268, 3, 529-537. Kulahci, F., Ozer, A., Dogru, M., Prediction of the radioactivity in Hazar Lake by Artificial Neural Networks, J. Radioanal. Nuclear Chemistry, Vol. 269, No. 1 (July, 2006). Özmen, H., Külahcı, F., Çukurovalı, A., Dogru, M., Concentration of Heavy Metal and Radioactivity Concentration in Surface Water and Sediment of Hazar Lake (Elazığ, Turkey), Chemosphere, 55/3, 401-408, 2004. Kamislioglu, M., Külahcı, F., 2015, Time series analysis of 222Rn Gas measuremments received from Osmaniye region. IEEE Signal processing and communications applications, art. no. 7130036, 1138-1141.